The Bride and Groom are solely liable for booking and paying for the venue for the wedding, obtaining and paying for a Marriage Schedule and any costs incurred for the ceremony such as decorations, candles, flowers and catering. All ceremonies have a fee based on preparation time. The total fee for a legal wedding is usually in the region of £250 depending on the amount of writing and rewriting involved and the anticipated travel time to the venue. To perform a rehearsal the fee is usually an additional £50-£100 depending on where and when this is to be held. Travelling expenses are charged at 50p a mile plus any extras for ferry journeys etc. at cost. When we have agreed that I am to conduct your wedding on a particular time, date and locations and this has been confirmed in writing then a non-refundable £50 deposit is required that that stage. You can pay this by using the link below. The remainder of the fees are to be paid at least two weeks prior to your wedding date. If you have any queries about how much your ceremony is likely to cost then please do get in touch. 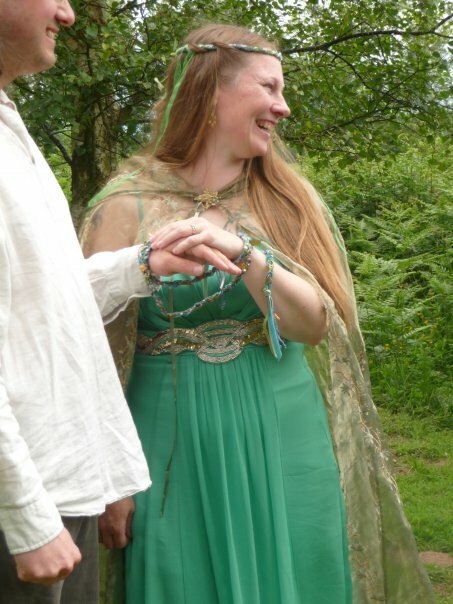 Deposit for handfasting ceremony. Please email me prior to using this link to ensure that I am available on the date of your choice.